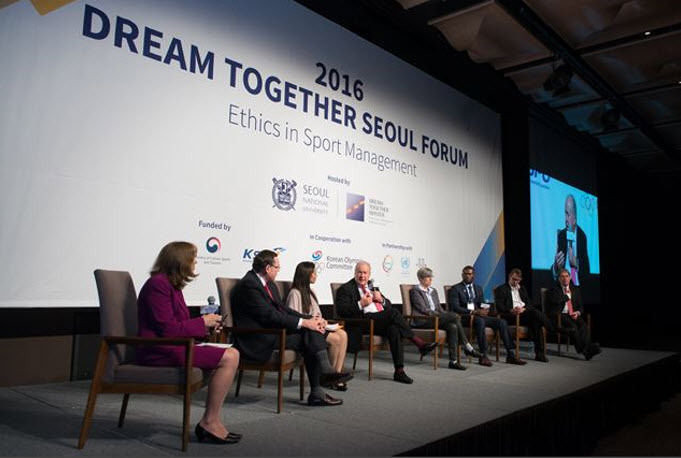 SNU’s Division of Global Sports Management Talent Development will host the ‘Dream Together Seoul Forum’ on Friday, November 24 at the InterContinental Seoul COEX Hotel. The forum is part of SNU’s ‘Dream Together Master’ graduate program, which aims to promote sports development in the world by training the next generation of sports administrators of developing countries. The program is funded by the Ministry of Culture, Sports and Tourism (MCST) and the Korea Sports Promotion Foundation (KSPO). Held under the theme of ‘Olympic Heritage and Sustainability,’ the forum aims to draw up an effective heritage conservation plan for after the 2018 PyeongChang Winter Olympic Games. Organizers of the Seoul 1988, Vancouver 2010 and London 2012 Olympic Games, who were successful in heritage conservation will attend the forum, along with members of the current organizing committees of PyeongChang 2018 and Tokyo 2020. Ben Fletcher, Director of the London Legacy Development Corporation (LLDC), present on stadium conservation methods from London 2012 and John Furlong, Head of the organizing committee of Vancouver 2010 Games, will introduce an after-games heritage conservation case similar to that of the upcoming PyeongChang 2018. Ji Chul Oh, former Vice President of the MCST, will present conservation methods used during Seoul 1988 and Joo Ho Kim, Vice President of the PyeongChang 2018 organizing committee, will announce the draft conservation plan for after the games with Hiromi Kawamura, Senior Director of International Relations of Tokyo 2020. The former Vice President and current Head of Legacy of the International Olympic Committee (IOC), Ser Miang Ng and Tania Braga will also provide guidance for such operations.